The community art room, with classes held every week, provides a safe space for socializing and creativity. When the Upper Sioux Community in Granite Falls, Minnesota, sought funding from First Nations Development Institute (First Nations) through the Native Arts Initiative, its goal was clear: increase access, awareness and inter-generational transfer of Dakota arts. Throughout its year-long arts project, the organization met its objective. And in doing so, it showed how the arts can unite people, strengthen community and foster healing. The mission of the Upper Sioux Community is to provide culturally-based programs and services that preserve Dakota traditions and promote education, healthy families, increased self-esteem and self-sufficiency of the Pezihutazizi Oyate. Complementing this mission is a vision to ensure that Dakota arts are easily accessible and appreciated throughout the community and region. 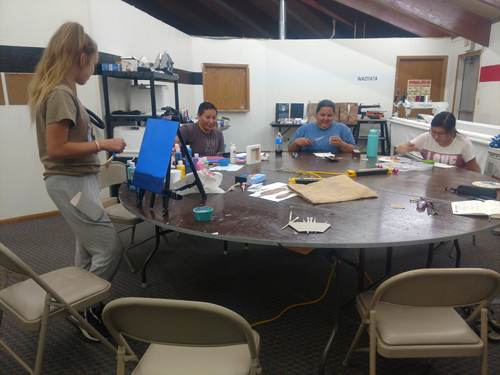 Since its founding, the Upper Sioux Community has sponsored Dakota arts in education, hosting after-school and summer youth programs for beading, hide painting, hoop dancing and other arts. It has also helped coordinate master apprenticeships, in which elder artists work directly with students to teach techniques hands on. For Autumn Cavender, the Dakota Arts Program Coordinator at Upper Sioux Community, the role of the organization has always been to expand the idea of art and uphold it the way it used to be: practical, social and valued. According to Cavender, traditional Dakota art served a purpose. “You made beautiful the things that you used,” she said. Art was not something to create and put on a shelf. Rather, art was a reflection of the energy and time that went into the things the Dakota used, wore or ate – whether it was a tool, article of clothing or recipe. The art of moccasin-making illustrates how the Dakota made beautiful the things that were used. There was also a camaraderie to art. In the past, she described, there weren’t “art classes.” Art was learned by generations of people sitting in a circle and trading techniques. There was no talk of mastering skills – in fact, there were social rules around how the first item made would be gifted after completion. People simply created together, cultivating a productive social and political dialogue. It was about pleasant social interaction. Another aspect of traditional Dakota art was that it had social value. Cavender said society valued people who could create the art, teach it and trade it. Art was part of the economy, and particularly skilled artists were valued by the community. In line with the First Nations grant objective to perpetuate, proliferate and revitalize traditional Native artistic and cultural assets, the new 12-month project was conceptualized to build on this vison – to bring art back to the way it was: a dynamic part of the culture. The project’s main impetus was to meet a need expressed by one of the master apprentices: A sewing group that was learning star quilt making had requested a space to quilt together. Recognizing the social role of art, the community wanted to first create a communal arts space. Through the project, it was able to designate a space in an existing community building and equip it with craft tables, storage, lighting and a quilting machine. The project then involved convening artist gatherings to promote Dakota art and to support and nurture artists. 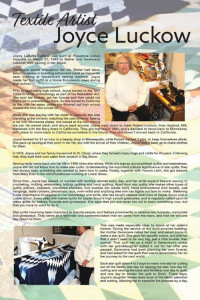 From there, community art exhibits were featured at the tribal headquarters. The project provided over 44 weeks of arts programming, and in doing so brought together quilters, painters, beaders and quillworkers in the communal space to share and learn. It also accomplished something inherent in the project title: Gathering and Healing Through Arts. Displays showcase artist profiles, which help raise the prestige of art in the community. With the project completed, there is a now a structure for classes in place, an established communal space, and the momentum to build on this success. In the Upper Sioux Community, art is being recognized socially and monetarily with the first artist showcase resulting in the sale of $1,300 worth of textile art. Cavender said people are excited to learn about who will be the next master apprentice to host in the roundhouse. And the project has created a foundation for next steps – expanded art programs, youth and adult classes, and maybe a designated retail space in the community. Getting to this point has been a process, and Cavender said they are thankful for the support of First Nations. 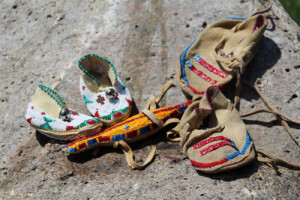 Of course, Cavender explained the organization needed fiscal resources, but it also benefited from First Nations’ advice, expertise, networking opportunities and connections. Moreover, she said First Nations understood the prestige of art and the need to showcase it properly with display materials, quilt racks and mannequins. “First Nations granted a legitimacy to what we wanted to do, and that translated into what we were able to do for artists and how we were able to promote them,” she said. The Upper Sioux Community met its goals in gathering and healing through art. The group united people and strengthened community. Importantly, it began to take art out of the “glass box,” where it was inaccessible and unusable, and made it part of the culture. There are more Dakota living on the Santee Reservation in Niobara, Nebraska. They might be interested in this type of a program. The quilts, moccasins, and decorative wear could meet practical, cultural, and other beneficial needs. Is there someone in your group available to make contact with this original, frontier, and dear to my heart people, to delve into their interest in this, as well as, your other programs?